As some of you may know, Deborah Frances, a naturopathic physician from Oregon, has been in seclusion for several years due to chronic disability and environmental sensitivity. We recently received a letter from her saying that she is definitely improving and hopes to be back to teaching, maybe not next year, but soon. We know how many people she has touched over the years, at our herbal medicine conferences and in the wider world, and would like to send her our support and love as she continues her healing journey. Whether you know her or have yet to meet her, this video from 2015 is a reminder of the inspiration she has brought to so many. We have created an account on our website to receive donations of any size which will be transferred to Deborah for her living and healing expenses. For a donation of $25 or more, we will send you a copy of her 2014 book Practical Wisdom in Natural Healing: Sage Advice for the Modern World. In Practical Wisdom in Natural Healing, Dr. Frances draws from over thirty years of experience in homeopathic, herbal, and naturopathic medicine to provide practical and easy-to-apply therapies for a multitude of conditions. The book opens with a discussion of basic principals of healing and is followed by a chapter explaining the science of homeopathy. 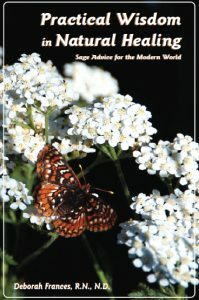 The rest is dedicated to practical tips for a multitude of conditions, interspersed with more lengthy discussions of several herbs, highlighting each plant’s unique personality and ability to impart spiritual as well as mental, emotional and physical healing. This book is full of practical advice and scientific references, but does not ignore the spirit that is alive within each of us and the plants who help heal us. Questions? Contact us by email or phone.